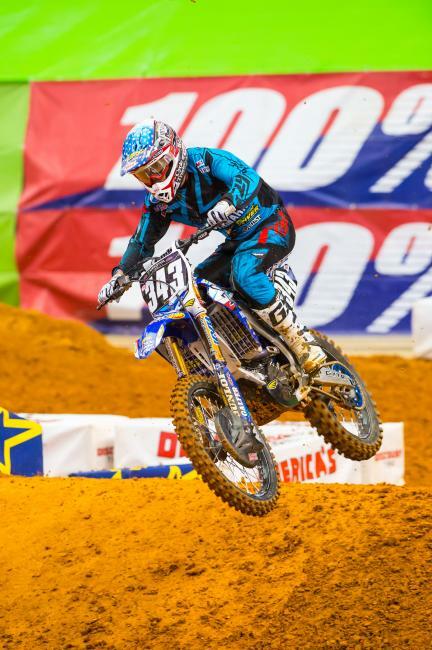 Monster Energy Supercross is back in the Georgia Dome for the second straight weekend, but this one has a twist: it's a retro night. Lots of teams and gear brands getting in on the act, stay tuned to our Instapics to get the flavor of the event. Or, just find that buddy of yours that's "stuck in the 80's" and set him loose. There's a nice variety going here, Yamaha, for example, telling the JGR men to go 1990 style white/red on their 450s, the Star Racing squad to go late 1970s early 1980s yellow/black, and the Rock River team the even older early '70s red/white. Chad Reed and Josh Grant have mid-90's Kawasaki graphics, Blake Baggett is way old-school on his Suzuki....we'll let the pictures tell the story but suffice to say there's more retro participation here than at the last few of these throwback events. 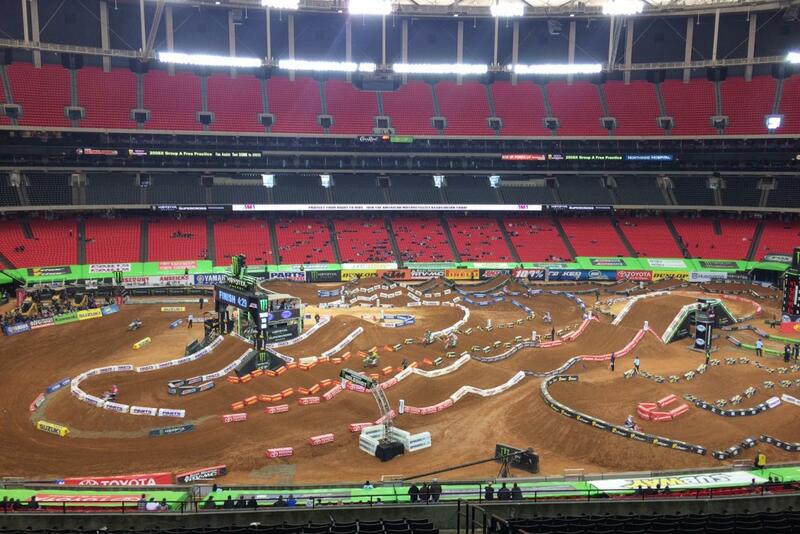 Hey and the track has an old-school element with the over/under bridge, and a generally tighter layout than last week. The whoops are super gnarly, there's a cool sand turn section after the bridge, and four solid 180 degree bowl berms to do some passing. The dirt also was pretty wet this morning, more so than last week's very dry surface, but most think it will end up about the same once the night show begins. 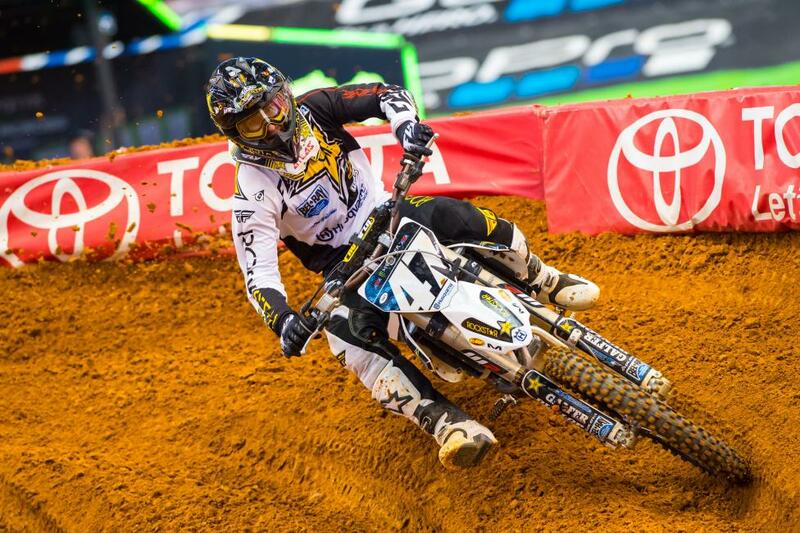 As for the racers part, Chad Reed is riding the momentum from his win last weekend. He looked frisky in the untimed practice--which although not timed officially, he was second fastest in it. That's good for Reed, who is never a highlight guy during practice. The usual players like Eli Tomac, Ryan Dungey and Trey Canard were quick, too. With Dungey holding a 25-point lead in the championship, it's go time for anyone looking to stay alive in the championship. They need to beat Dungey consistently, which is a tall order the way he's riding right now.